Couple more hours left to print and it looks great, except for the arches. Some would get to a certain height and then break off. I didn’t enable z-hop which may have helped. I’ll post pics when it’s done. Sorry to hear you had issues with the arches. It sounds like a printer setting issue, unfortunately. z-hop would definitely help, as would slowing the print speed down for the layers that have the arches. You could also print just one of the arches, cut off the broken one from the model, and glue in the new one. Or even leaving a broken off arch might make it look like a worn castle? Missing one arch won't allow any dice to jump out, so don't worry about it from a functional standpoint. Oh it was most of them. I am sure 60mm/s is too fast and I guess my printer isn’t as dialed in as I thought. The rest turned out well though. I'll sand the knobs down/off that are left and paint it. It’s a present for my brother so I’ll get some feedback from him on how well his dice work. Bummer that it was all of them. Looking at your print, it does look like there is room for improvement with your settings to smooth the print out, which would definitely aid with the arches printing properly. 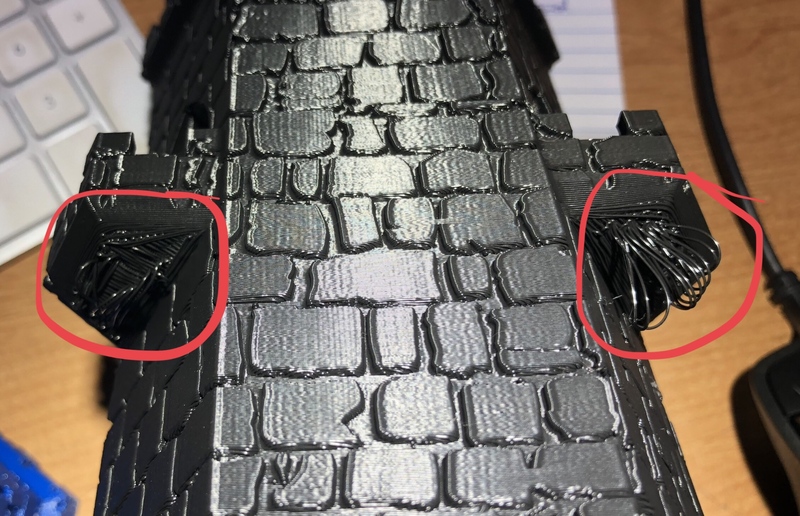 If your brother notes an issue with dice jumping over the edge, there is a portcullis you can print that can be glued to partially cover the doors and slow the dice down. I bought a couple sets of dice to play with and put a lot of rolls through the tower with not a single dice jumping the wall. The randomizer floor worked perfectly and my 5yo and 2yo got a kick out of playing with it. I’ll probably print another one. Thanks! Glad you like it and that it's working for you! Enjoy!! Will the middle/top floor from the 3rd floor randomizer model work with this one? I merged this into one solid piece so it prints all as one, which means there's no interchanging possible. 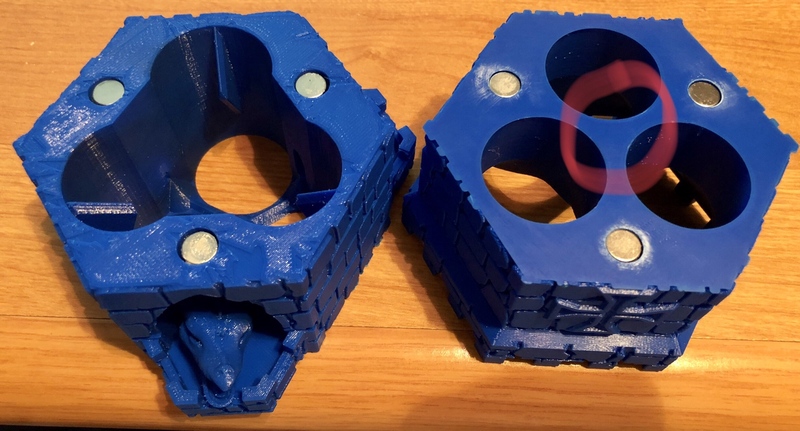 If you want to mix and match other pieces I suggest you go to the original creator's files and print them as originally designed and use magnets to hold them together. Although I didn't change the dimensions of the tower, so if you're wanting to use Tinkercard or something like that to splice other pieces into this merged tower the other pieces should all match up without issue. 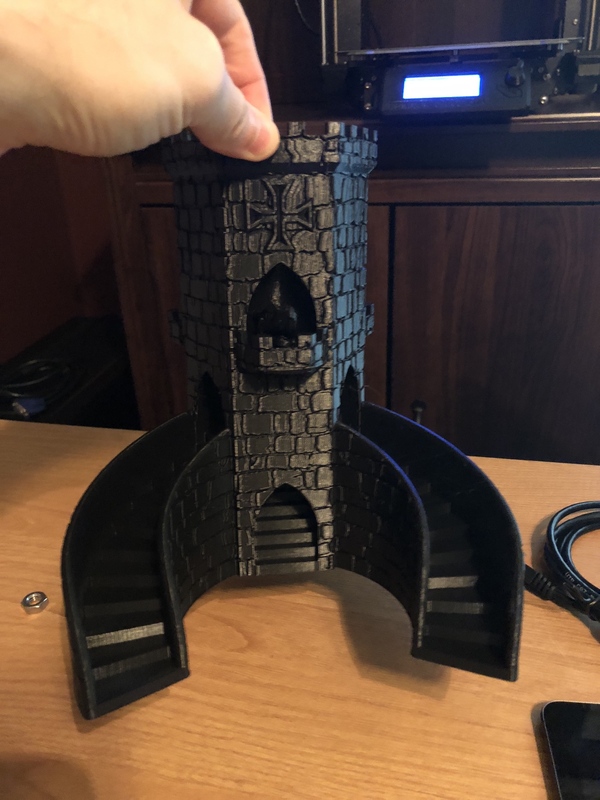 Awesome print, but i have a question, my printer goes up to 190mm only, if i reduce the size to 185mm the dices will get stuck on the doors or not? Great question. Are you using D6 or D20? D20's for the most part, but maybe both, thank you for your response! I don’t have a D20 to look at for size, but I just checked my print and I don’t think shrinking the file is a good idea. A D6 would probably still fit through the interior, but I really don’t think a D20 would. 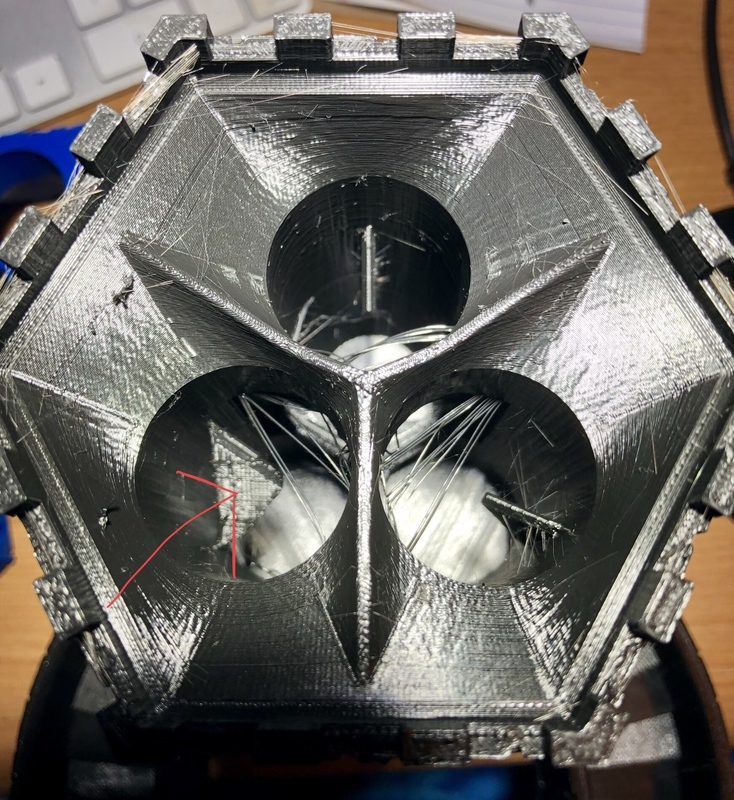 Instead, I would recommend loading the STL into Tinkercad and cutting off the bottom 15mm, or as much as you need to fit in your printer, and then printing it. Round up how much you need to cut off the bottom to make it a full stair height (meaning, don’t remove 2.5 stairs, instead remove a full 3 stairs) and you’ll never notice that the printed model has had part of the bottom removed. Let me know if you have more questions! Nice work, looking forward to seeing this finished, and your 33h print! You should probably mark this thing as a work in progress to keep people from trying to print it! Just marked it as work in progress, thanks! Very strange. Well, that's the next thing for me to look into. If I don't readily see any issues, guess I'll just add a box at the union of each randomizer nub and the interior wall to ensure there's plenty of overlap. Say thanks by giving Dr_Pippin a tip and help them continue to share amazing Things with the Thingiverse community. Dice tower - combined with randomizer floor & stair arches by Dr_Pippin is licensed under the Creative Commons - Attribution - Non-Commercial license. Say thanks and help Dr_Pippin continue to share amazing Things with the Thingiverse community. You'll need a PayPal account to tip Dr_Pippin. Click the button below and you will be redirected to PayPal. Once the payment is complete, you'll be brought back to Thingiverse.